We’re nearly clear of January diets and fad resolutions so I’ve decided to post about two totally irresistible biscuits from Waitrose and Marks & Spencer to tempt you. Quite the biscuit connoisseur, I believe a cup of tea is simply not complete without a buttery round of yumminess and these two certainly take the biscuit! First up is Marks and Spencer’s All Butter Carrot Cake Cookies (picture and info to follow). These crunchy cookies combine everything that I love about carrot cake – the sultanas, the spices and are so moreish, you have to be careful not to eat the lot. I absolutely adore carrot cake, (and even had a go at making my own carrot cake cupcakes here), and these cookies sum it up in one (bar the icing, which is shame and would be a fantastic addition). I would prefer if they weren’t so hard and a little chewier plus it seems M&S has used granulated sugar within the recipe so it makes the biscuits very sweet indeed – bad for guilty consciences! Still, these cookies are delicious and I’ve not seen another like them!. 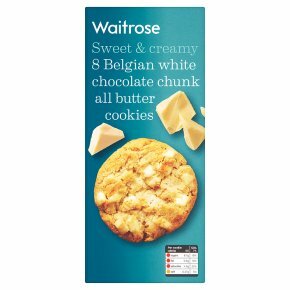 Another household favourite at the moment is Waitrose’s Belgian white chocolate cookies. The tag-line reads, “sweet and creamy”, and sweet and creamy they sure are. Thick chunky shortbread is dotted with lots of large white chocolate chunks. These cookies remind me of homemade white chocolate blondies, I think it’s the caramelised white chocolate that gives it that kind of “caramac” taste. It’s refreshing to see that there are at least four or five chocolate chunks per biscuit – not sparing at all. I also love the sharp taste of the salt which brings out the creaminess of the Belgian chocolate with every bite. These biscuits come in a pack of eight and don’t last long (in my house anyway) so it’s lucky that they are currently on offer, coming in at 2 packs for £2.50. Usual price £1.75 per pack. N.B I should probably mention that I was first introduced to the Nakd range when starting my first foodie PR role however, have remained a firm fan despite leaving earlier this year. Not too biased! Posted in foodTagged biscuits, carrot cake, cookies, m&s, nakd, product review, snack, tea, treat, waitrose, white chocolateBookmark the permalink. Are you making the tea?